Hooray! I have finished several things just in time to count them for the end-of-the year report! 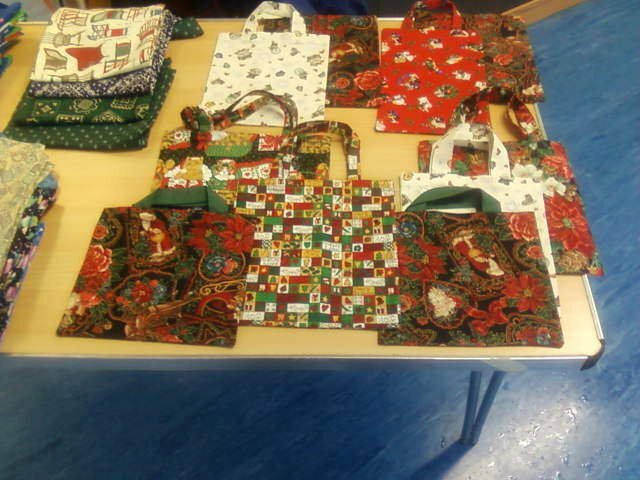 We had the annual Christmas fair at school, and I made bags again — this time in several sizes. The small gift bags were the best sellers, especially the ones sized to hold DVDs and CDs. 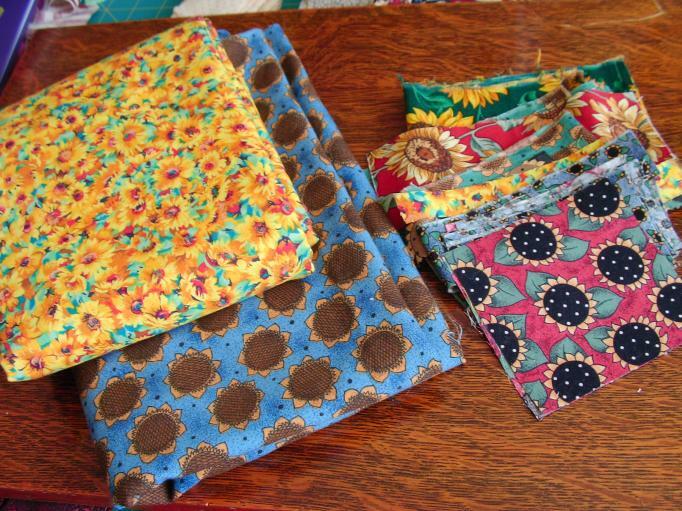 I also made the usual grocery-shopping sized bags in bright fabrics. 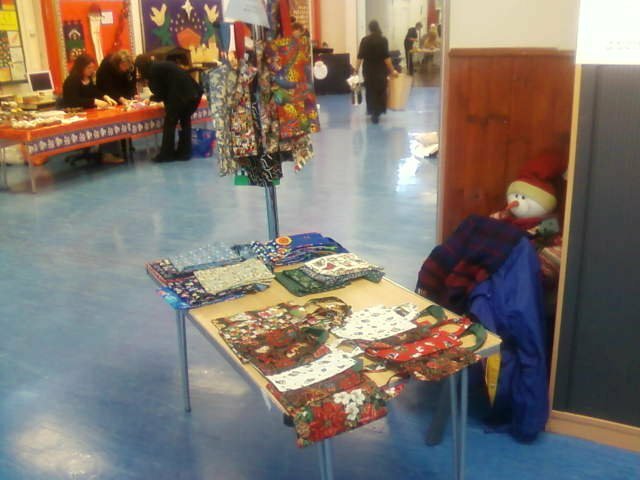 Here is my table in the corner of the school hall. A coat rack makes a great display for hanging bags! 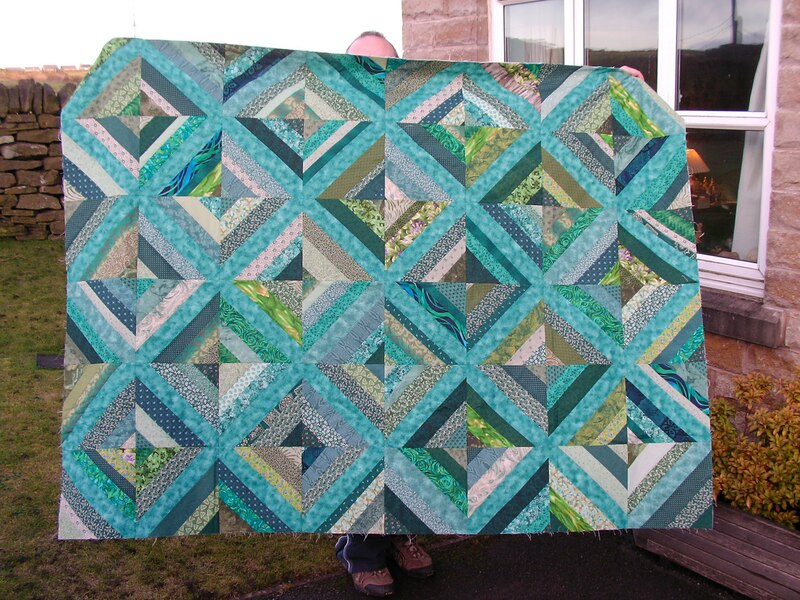 I made this green String Quilt top for a friend and have already pieced the backing. Now it just needs quilting and binding. 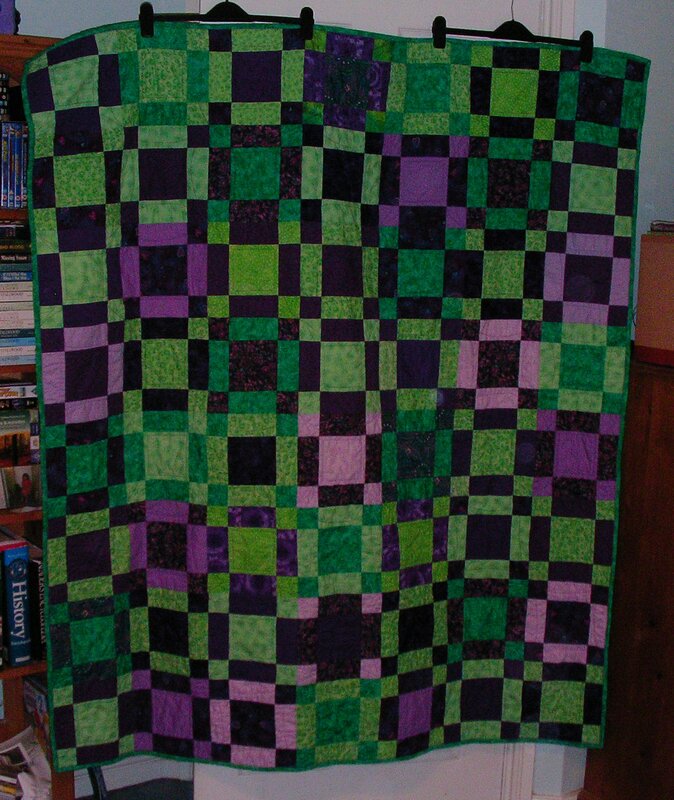 I quilted this project using a Continuous Curve motif designed by Carla Barrett. Then I went back and stitched a quarter inch inside the edge of each large centre patch. 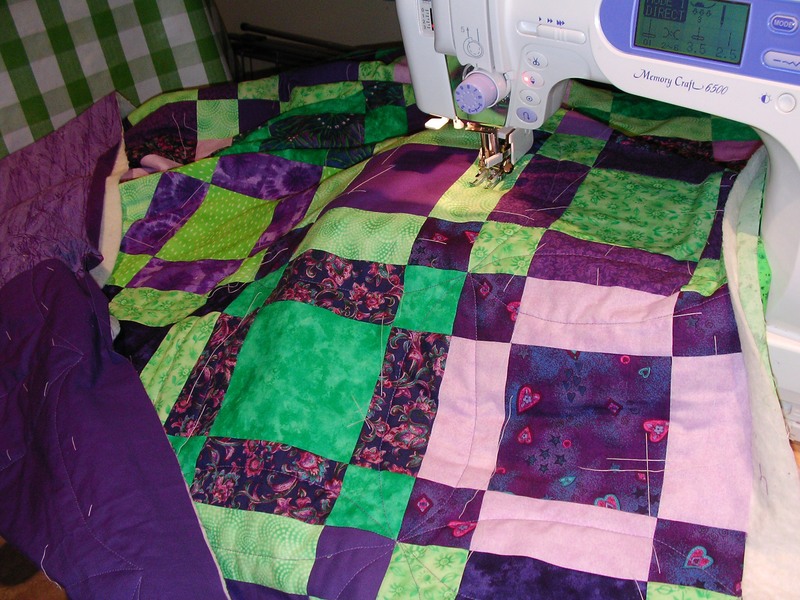 The backing was pieced using large left-over pieces of green and purple fabrics. Happy New Year, everyone, and Happy Quilting! The quickest kind of stashbusting! I haven’t been sewing very much lately, but our oldest daughter has some new projects on her design wall! 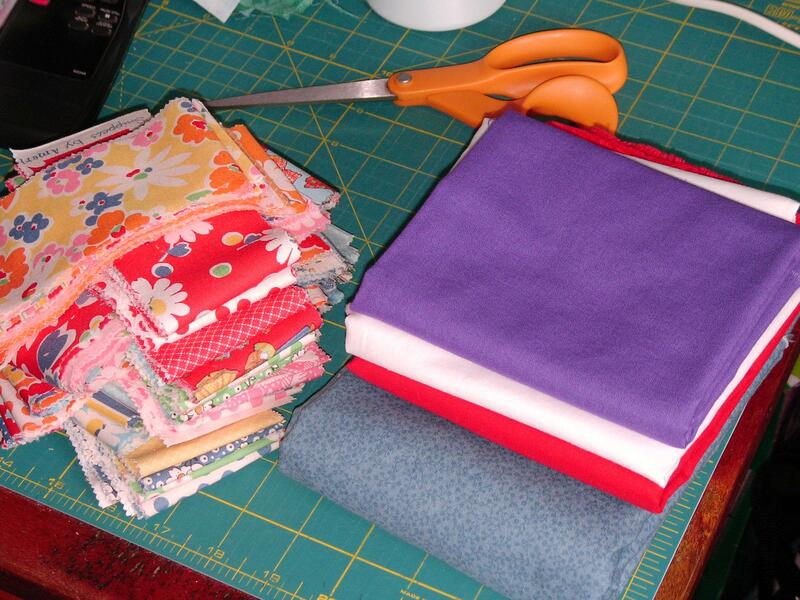 She went shopping in my fabric stash this week, and look what she took home! Hooray! She took 3.5 yards of that grey corduroy my friend gave me last Spring, plus some other goodies — about 7 yards total. Here are my totals for the year so far. It’s two steps forward and one step back. I’m afraid there’s not much progress towards positive numbers in the Total Used column! To see how others are progressing with their Stashbusting, please visit Judy, who hosts the Stash Report on her blog. 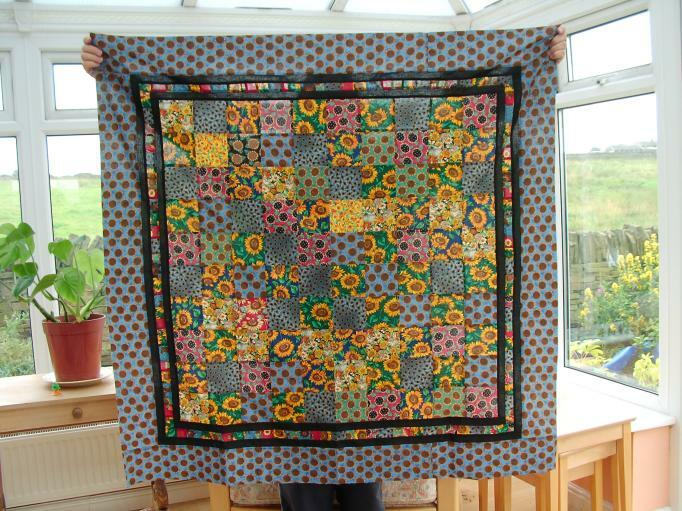 My Sunflowers quilt top is finished — right on deadline for my own little Quiltathon to join in with Judy Laquidara’s big Quiltathon. I was able to make the quilt top larger by adding four borders, and it’s now 50 inches square. The yellow print below is going to be the binding and backing, the blue fabric is what I used for the wide border, and the small pieces are what I used for the pieced border. I sewed the little bits together in Chinese Coin fashion, and then trimmed them to get four equal width strips to go all the way around. What bliss! I’ve been sewing every single day this week! I have now finished 58 patriotic blocks, and I made a second recycled bath mat. I also did some mending, cut out a pair of pyjamas for my little girl and started basting a lap quilt that’s been waiting in my stack of UFO tops. 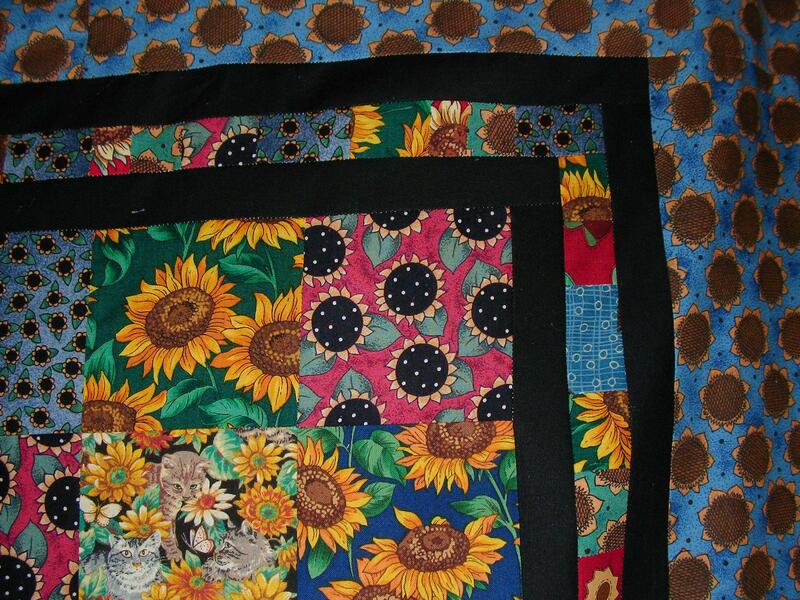 My Grandmother’s Flower Garden blocks have also seen the light of day this week. There are many more flowers than I remembered! I’ve been having difficulty doing hand sewing lately because of arthritis in my thumb, but I despair at abandoning this project, so I’ve come up with a plan! If I work on it for 15 minutes at a time just a few days a week, I could probably make fairly good progress over the course of a year. I’ll put this at the top of my Goals List for 2011. 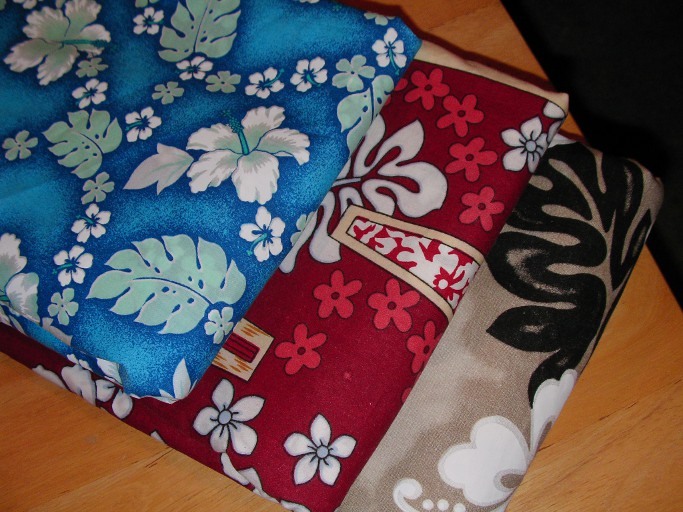 For my Stash Report, here is some new fabric from America. 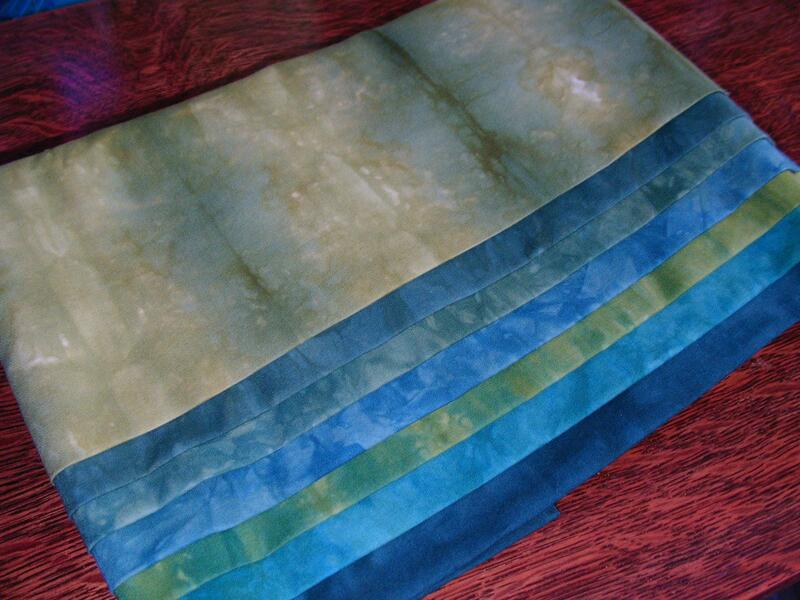 I bought this set of 7 hand-dyed fat quarters from my Internet friend Vicki. Aren’t the colours pretty? 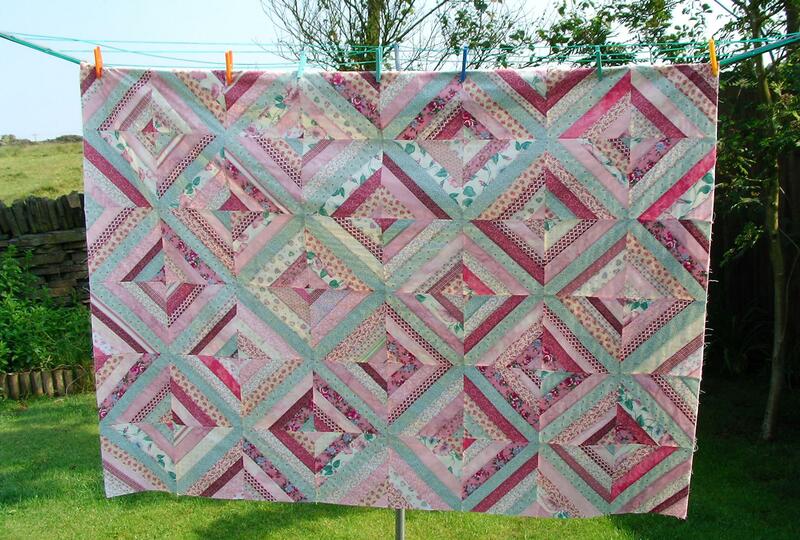 Please visit Judy’s blog to see how other quilters are getting along with their stashbusting this week. …my very first Jelly Roll ever (I’ve already separated the strips into groups), and some red, white and purple solids to replace stash I’ve used, with a blue tone-on-tone print for borders. While I was playing with my new fabric yesterday, my dear husband went for a walk in the countryside near our house. When he returned, he brought me a bouquet of wildflowers. I think they are Red Clover. 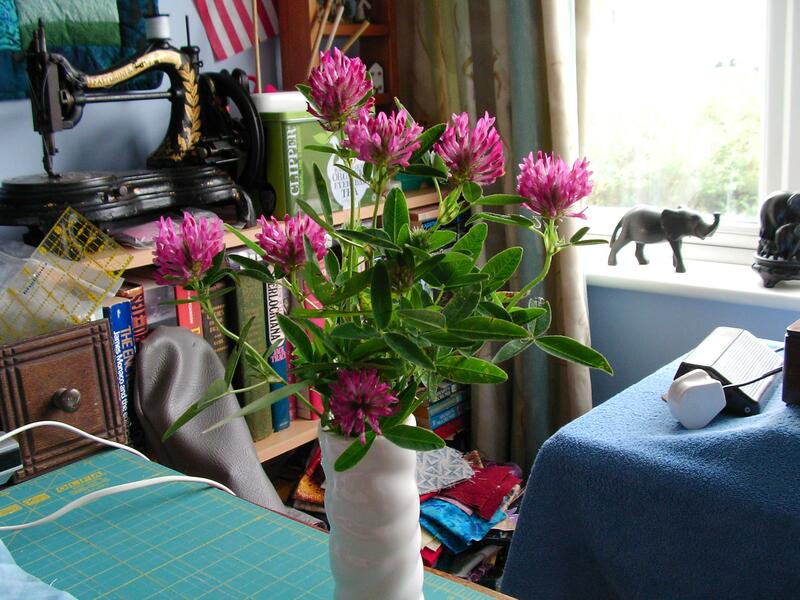 They look so pretty, I put them in the sewing room for inspiration! 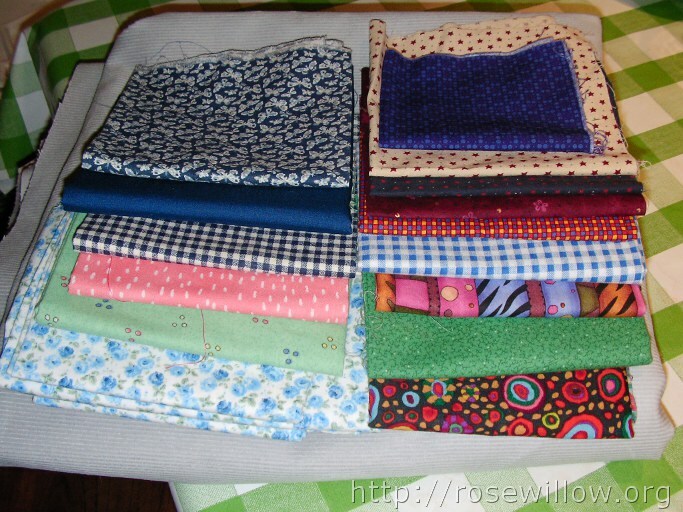 Please visit Judy’s blog to see how other quilters are progressing with their Stash Busting this week. Hooray, I’ve finished my pink and green top, and I have something positive to contribute to today’s Stash Reports. This was taken early this morning, and it’s a beautiful day in Yorkshire! Finished size is 54 x 72 inches. It’s the HeartStrings pattern, starting with 10-inch muslin squares for backing and then trimming the squares to 9.5 inches after piecing the strings. 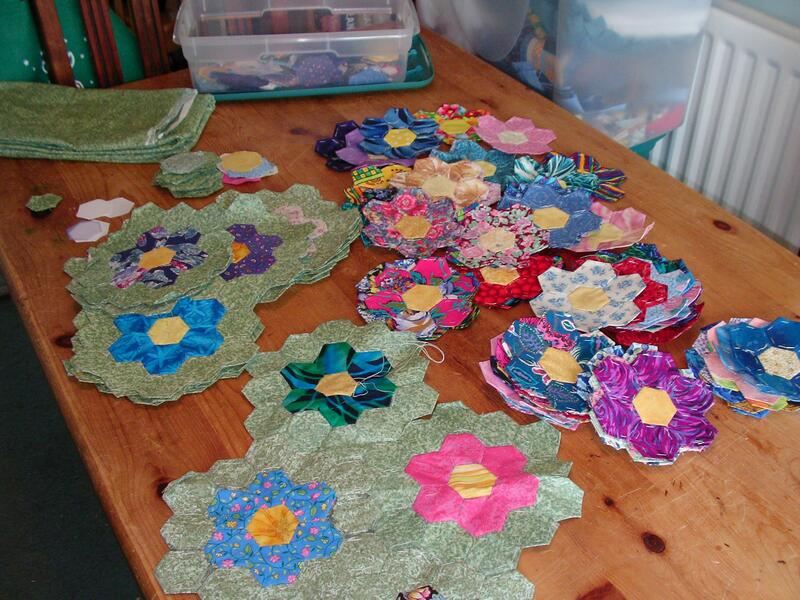 To see how others are progressing with their Stash Reports this week, please visit Judy’s blog.